LANCASTER, Ohio — No fairy-tale ending here. Whiteoak built a 4-0 lead after an inning of play and ultimately held on to claim a 5-4 victory over the Eastern baseball team in the 2018 Division IV Region 15 championship game Friday evening at Beavers Field. The Eagles (27-3) closed to within 4-2 through three complete, but the Wildcats (28-2) extended their lead back out to 5-2 as they headed into the fifth. 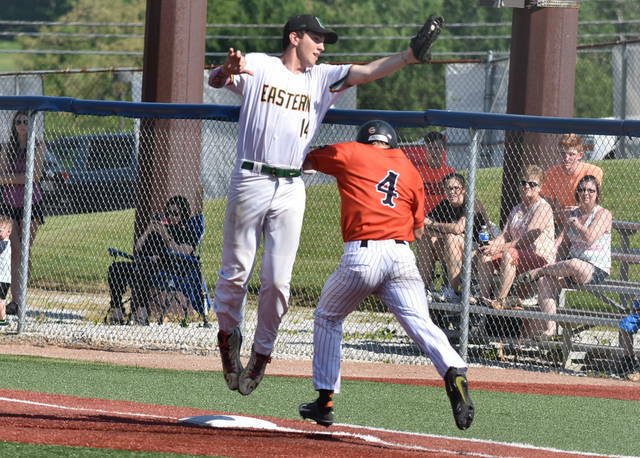 Eastern scored two runs and had the tying run at second base with two away in the bottom of the seventh, but ultimately came up short in the one-run outcome. Whiteoak becomes the first Southeast District baseball team to reach the Division IV state tournament since Portsmouth Notre Dame accomplished the feat back in 1992 — the second postseason with a four-division format. A complete recap of the Eastern-Whiteoak contest will be available both online and in the weekend sports edition of the Sunday Times-Sentinel.